The proposal finds its inspiration in the traditional romanian house, whith long, supple surfaces annexed to the walls, complementing the shape of the space. 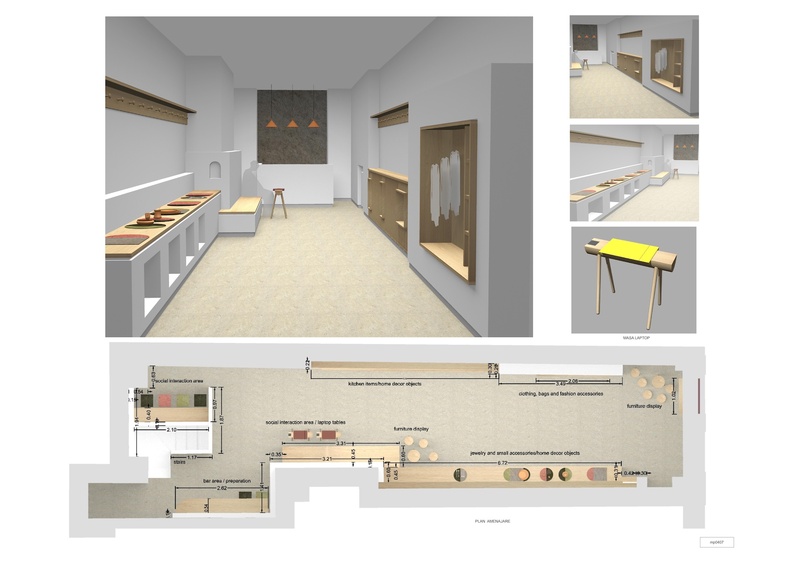 The project focuses on the simplicity of the volumes and lines, using natural materials (wood, felt)in a neutral color palette, and intends to create a discrete and complementing image frame for the products exposed in the shop. The materials used in the proposal are natural/ecofriendly ones and include wax polished wood, felt and simple plasterboard volumes. 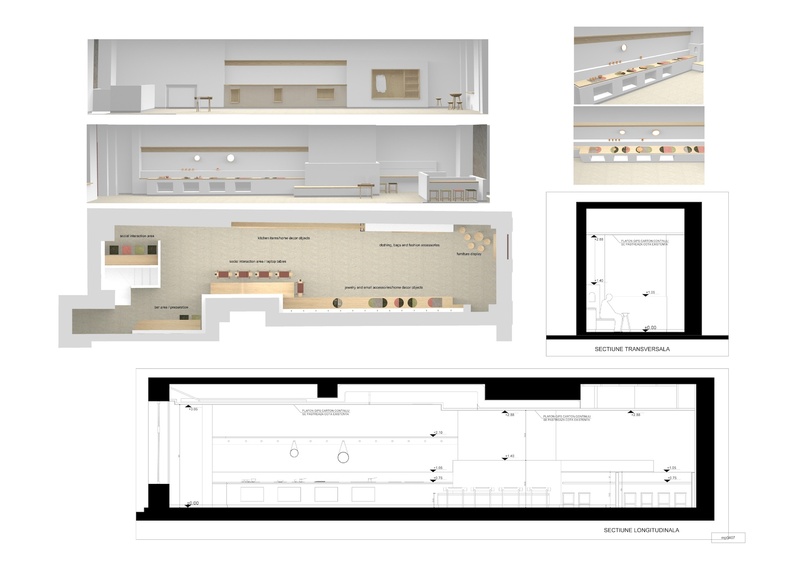 The proposal includes two main functional areas located near the entrance (for product presentation and sales) and in the back (for social interaction), and a transition space, placed between the two, with multifunctional purpuse. A long median sitting place ensures a smooth transition between the two areas and can be used either for product presentation or as a meeting/interaction space. The small laptop tables presented in the proposal can be disposed along the sitting place, used for meetings, workshops, or as display items. The tables present detachable wooden laptop plates and permit economical storage. The product presentation area is flexible. The need to emphasise various limited-edition collections is provided by a combination of coloured felt plates, in simple geometric shapes, which can be also used in different events as displays. The lighting scenario needs to be efficient and discrete, consisting in long white lighting rails placed in the ceiling surface, parallel to the walls. The back area of the shop is punctuaded by copper lighting fixtures produced by artisans.